After 90 days of riding in the Arai RX-Q Helmet, Anthony gives his opinion of the features and functionality of the helmet. It seems that Arai has delivered on all fronts with this helmet as Anthony has nothing but good words for it, considering it one of his favorite motorcycle helmets in the RevZilla lineup. Check out the full video below! The Arai RX-Q Helmet is essentially the apex of premium sport touring helmets. It is Snell 2010 certified and offers great balance and aerodynamics for long rides. It is also very lightweight and designed in a way that distributes its mass in a way that maintains serious comfort. For the last month we've (finally) had full inventory on this helmet; it was very spotty since its introduction early this year. But now it's in our warehouse, and we have a ton of them in all sizes, solid colors and graphics. It is also now available in a hi-vis option as the Arai RX-Q Hi-Viz Neon Helmet. To see the full look at this helmet, visit our Arai RX-Q Helmet Video Review. 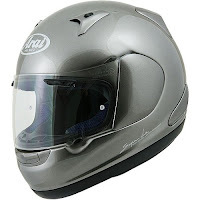 You can see this helmet and all its competitors by visiting our touring motorcycle helmets page at RevZilla.com.